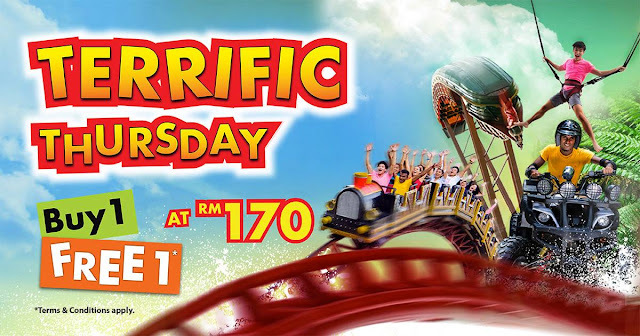 Sunway Lagoon Theme Park is offering Buy 1 Free 1 admission ticket on every Thursdays just got better when you and your friends can enjoy the “Buy 1 Free 1” offer on every third Thursday of the month, starting from January till November 2017! Ticket (s) available on a first come, first served basis. Ticket (s0 purchased are only valid on selected admission date. Child denotes those above 90 cm in height and age 11 years and below. Admission ticket includes entry to ALL parks, including all rides, activities and attractions.